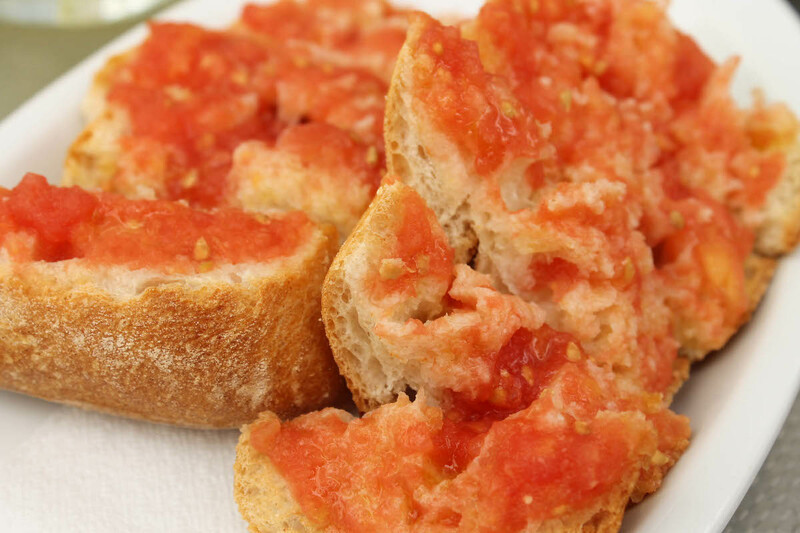 Be prepared for a lot of jamon, sangria, and churros. I’m back in Boston but still in a daze from my lovely vacation. In all honesty, I didn’t know what to expect when I first arrived in Spain. I knew I would love the food, I knew I would love the culture, I knew I would complain about the heat. But I didn’t expect to be planning a return trip even before my vacation was over – it was just that wonderful. 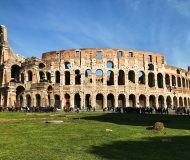 Unlike my trip to Italy, where I was enthralled by every single thing because it felt so exotic and romantic, Spain felt familiar and comforting. 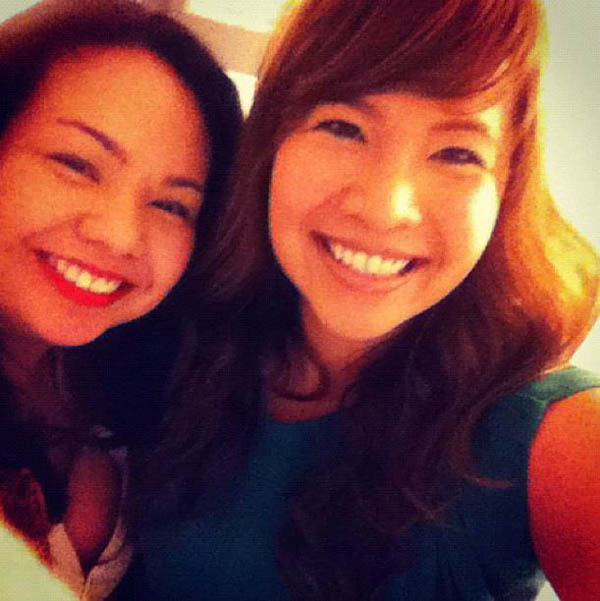 It helped that I understood and spoke the language (eight years of studying Spanish is finally paying off), and it was absolutely spectacular to share the adventure with one of my dearest friends from the Philippines, Fe. Fe and I decided to go on a trip together last December, so we had several months to save up and plan. Actually, being the good friend that she is and understanding my control-freak and planning-inclined nature, Fe let me plan all the details. 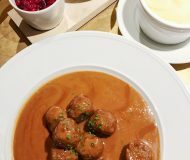 Naturally, if you leave the planning to me, then you should expect to have a lot of gastronomic excursions and numerous pit stops for dessert. 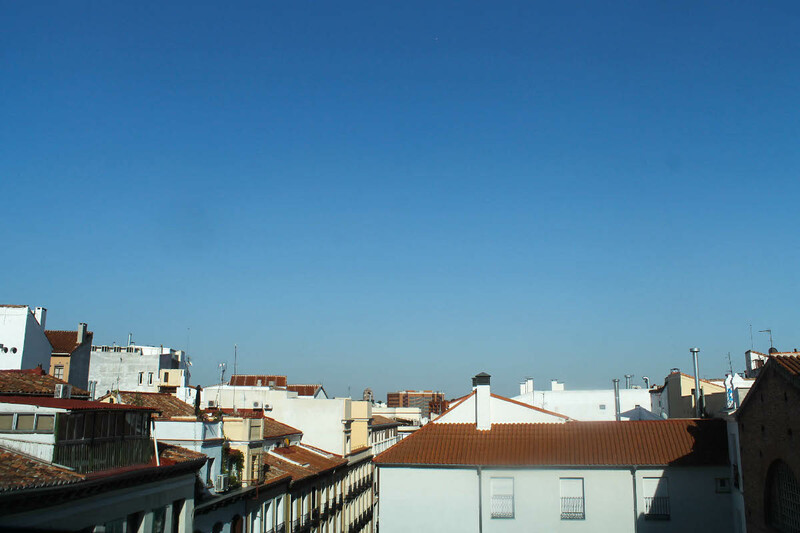 We went on a 5-day tour of the Andalucian region (Cordoba, Seville, Ronda, Costa del Sol, Granada, and Toledo) but made Madrid our home base – we were there for a couple of days before the tour, and a few more days after. 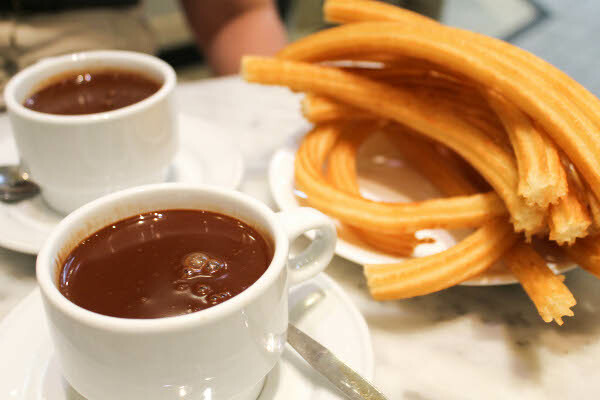 Churros are Spanish fried dough, usually served with thick hot chocolate or coffee. 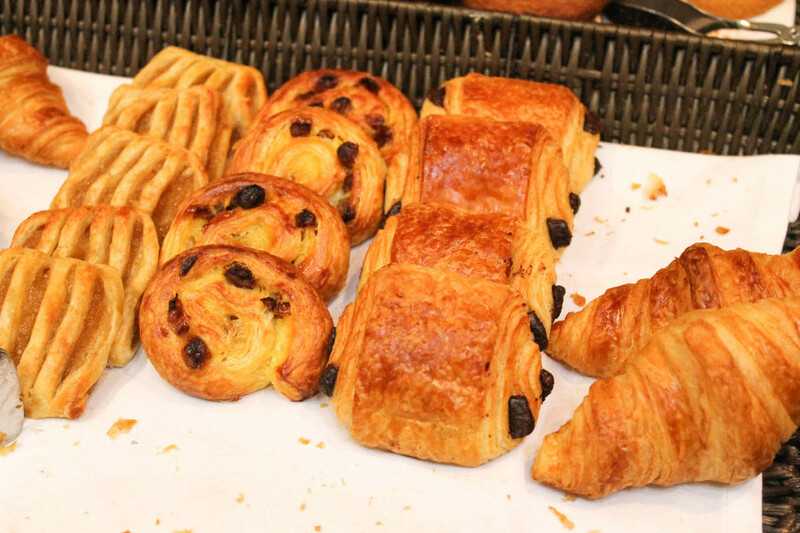 It is typical breakfast fare, but at Chocolateria San Gines, it is served all day long (literally, as in the place is open 24 hours). 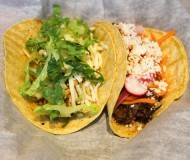 We went there a few times and basked in the lively atmosphere, coupled with affordable options for food and drinks. This is a big statement to make, but I prefer jamon Iberico (Iberico ham) over prosciutto, over bacon, over any kind of cured pork or pork belly. 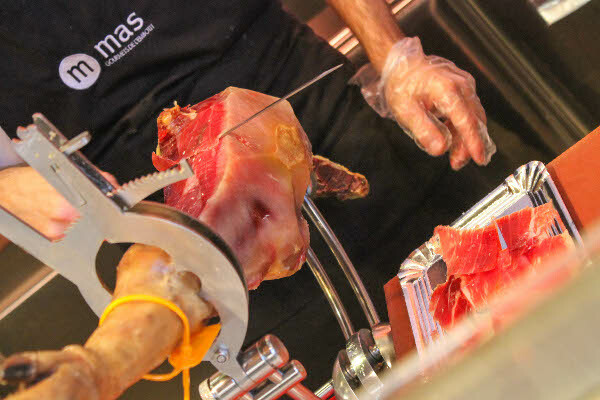 Jamon Iberico, also called pata negra, is made from black Iberian pigs, which are bred on acorns and olives to produce the most strikingly-marbled meat. 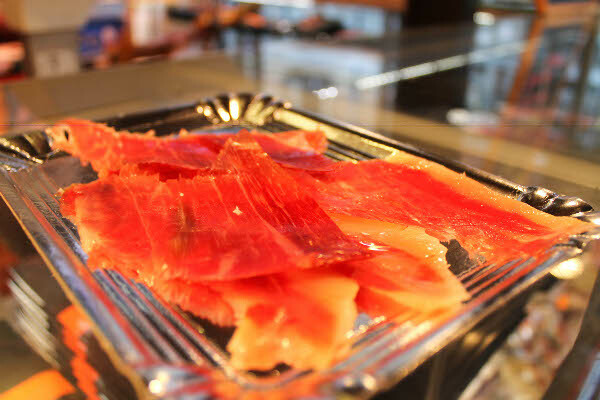 Jamon Iberico is sold all over Spain, but it is one of the most expensive food products in the world. 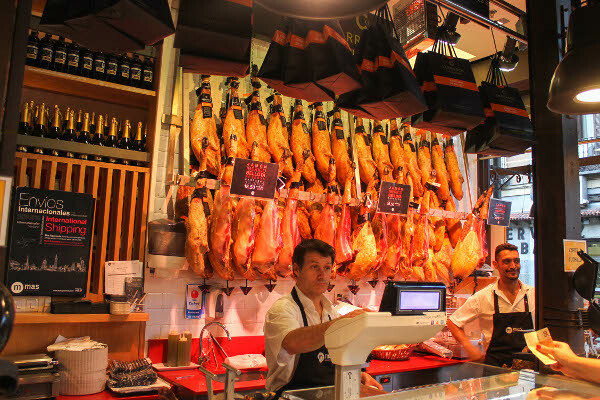 At Mercado de San Miguel, there is a stall where you can choose from different grades of ham, and the butcher slices it there right in front of you, from one of the many legs of ham hanging from the wall. Pintxos are small bites (as opposed to tapas, or small plates) or snacks eaten in bars. 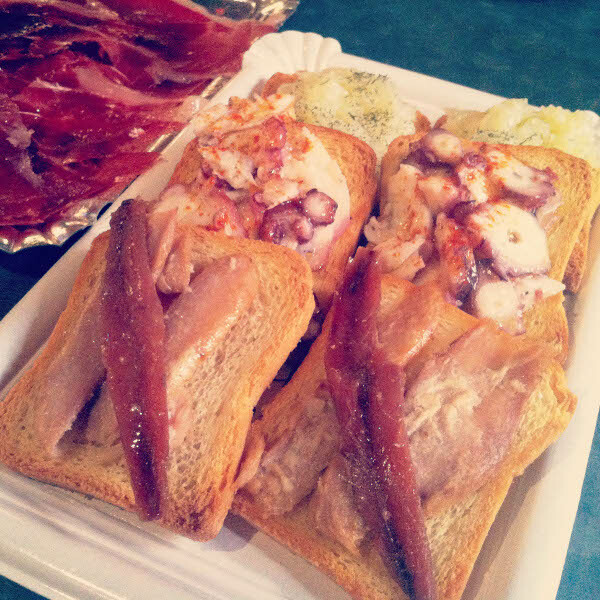 Pintxo, or pincho, literally means spike, and most pintxos are skewered, often to a piece of bread. 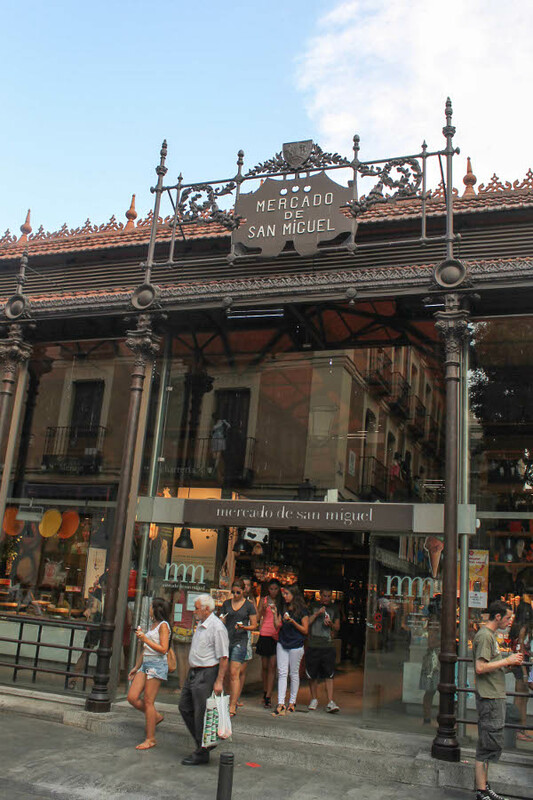 There are dozens of stalls at Mercado de San Miguel, each selling different kinds (sweet, savory, meat, seafood, fried, etc). 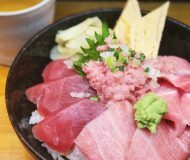 We shared this plate of tuna with anchovies, cod liver, and bacalao with olive oil and dill. 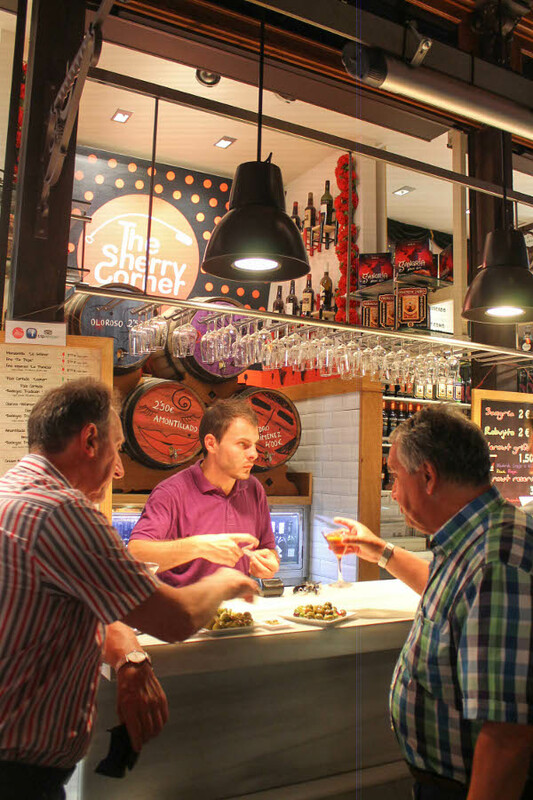 In addition to the many food stalls, there are also various places for drinks at Mercado de San Miguel. We tried sangria (which I also had everyday, hehe) and different kinds of wine. 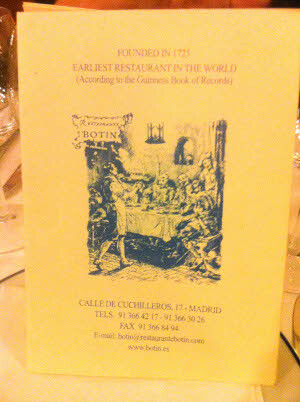 Restaurante Botin is the world’s oldest restaurant and possibly the most special meal we had during our trip (and by special, I mean white tablecloths and reservations were required). 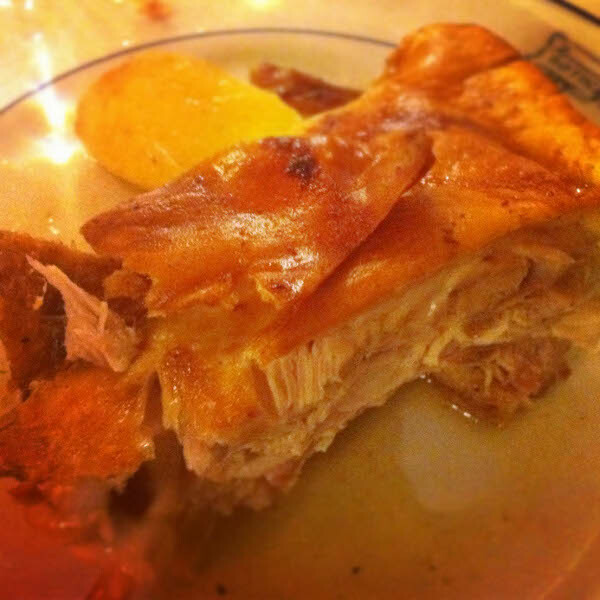 It is located on Calle de los Cuchilleros and it specializes in cochinillo (roasted suckling pig) and lamb. Now, if you must know one thing about Filipinos and food, it’s that we love our lechon, or whole roasted pig. 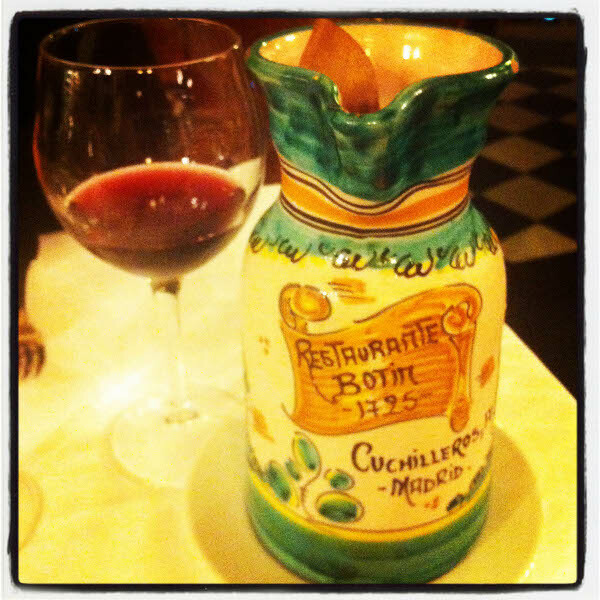 So of course Fe and I had to make sure that we get to try some cochinillo at this world-famous restaurant. 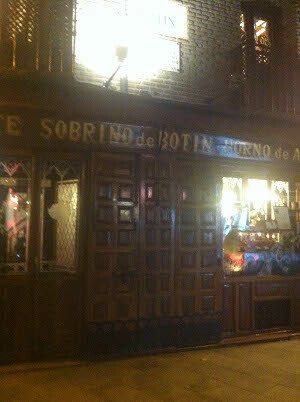 Botin has a very old-fashioned feel, and the service was excellent. There were even some gentlemen singers who performed a few Spanish songs, which added to the joyous atmosphere. The cochinillo was tender and succulent, with crackling crispy skin. It was simply served with roasted potatoes, but we ordered a couple of sides too (eggplant and mixed veggies) since we just split one portion of the roasted suckling pig. We also shared a pitcher of luscious sangria. 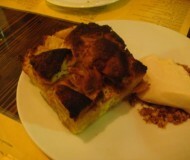 It was such an excellent dinner! I highly recommend our hotel, NH Palacio de Tepa. It is built on top of the ruins of an old Spanish castle, and the hotel itself is a beauty reflecting 18th century Spanish architecture. 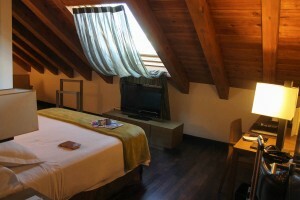 It is also just a few minutes away from the famous Plaza Mayor and other attractions. 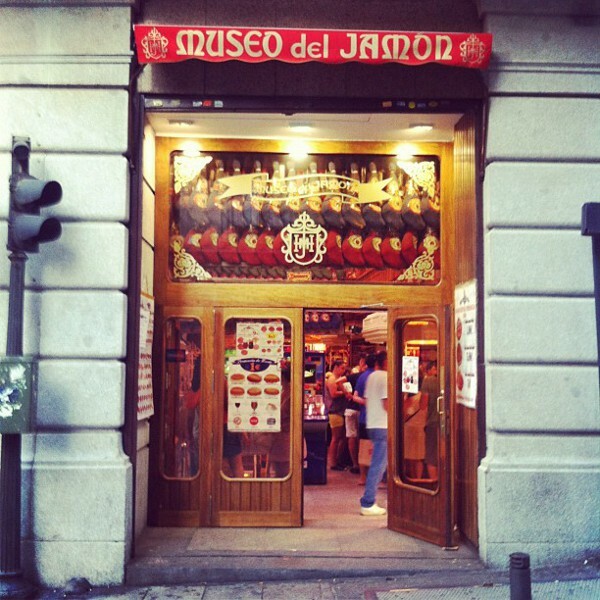 Yes, indeed, that is the Museo de Jamon, or Museum of Ham. 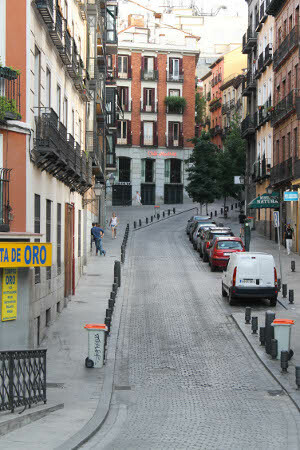 *sigh* I love Madrid. I’ll post more recaps of Spain in the coming weeks! Welcome back, this is such a great post. Spain is one of the top places I’d love to have the chance to visit one day. 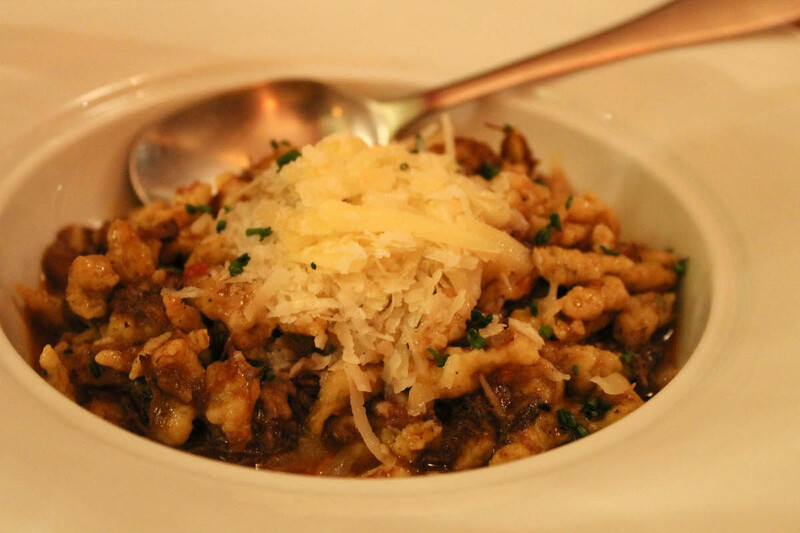 I know this is just a sampling of what you experienced, but the food just looks and sounds incredible. And I’m with you on the planning. 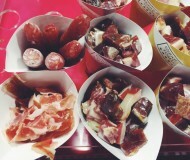 Going to Museo del Jamon would definitely be on my list :). Wow, what a trip!! The chocolate dipping sauce and churro combo looks DIVINE. As someone who had a similarly indulgent vacation earlier this summer, I can imagine how happy you were in Spain! Thanks Emily! And now I know how you feel upon getting back – all I want is some veggies and fruits! Those Churros and Chocolate look so amazing. 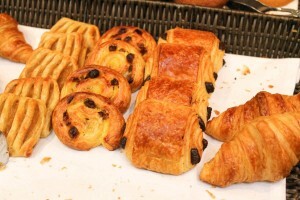 You’re pictures even convey that relaxed, comfortable feeling you mentioned. I’ve only been to Barcelona, and would LOVE to get to Madrid someday. Glad you had such an amazing time! Thanks Amy! Barcelona is next on my list! I’ve been meaning to go to Madrid for ages now and I’m not sure why I haven’t made it yet. 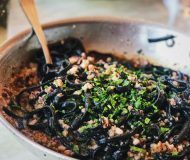 Spanish food is one of my absolute favourites – a diet of jamon iberico and churros could sustain me for the rest of my life! Yum! Chocolate dipped churros and ham? Delicious! I went to Spain in high school, and your post is reminding me that I really need to go back. (Italy first!) I love all your food pics! Looks like an amazing trip! 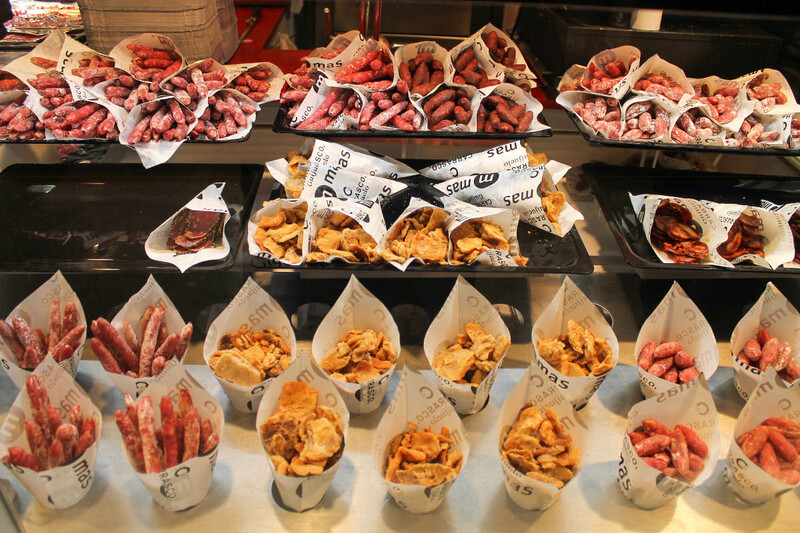 I remember in college being there and the amount of jamon hanging in the windows – it was amazing how much there was! 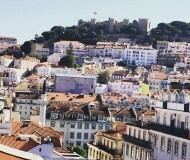 Such a great city! 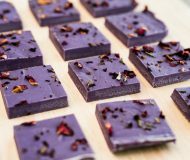 I am over the moon happy after reading this post. Its takes me right back, of course! 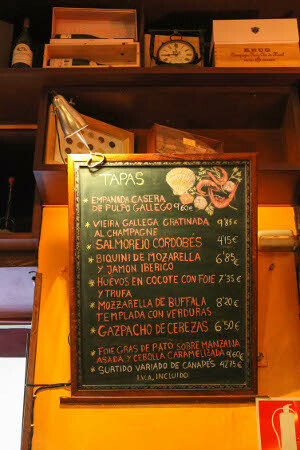 Madrid really is the best, and so is the never ending sangria pitchers, jamon iberico and CHURROS!!! So glad you enjoyed yourself, can’t wait to hear more! 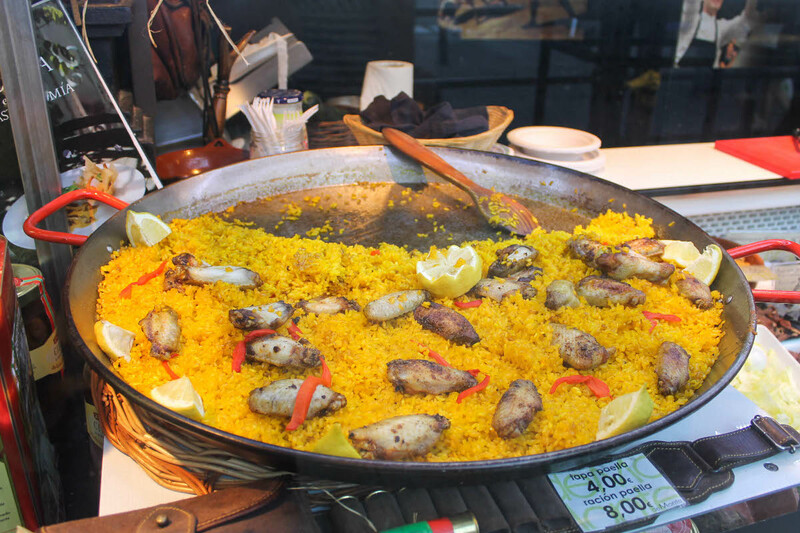 I walked by a restaurant that was serving paella and thought to myself – I need to go to Spain. And, then I came home to find this post! PS you can post about those churros all you want!!! I never went to Madrid when I was in Spain. That market alone makes me want to go. 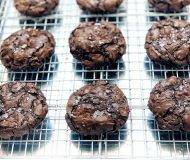 Mmmmm this looks like one delicious trip! It was so fun getting to read through (and see pictures of) your trip! Welcome back to Boston … and I hope you aren’t experiencing separation anxiety from those churros! 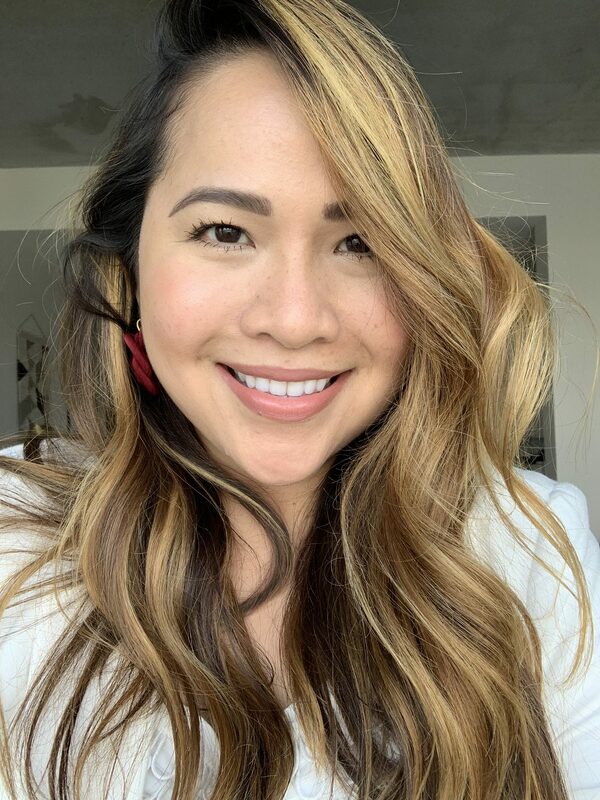 Beautiful photos, Bianca! 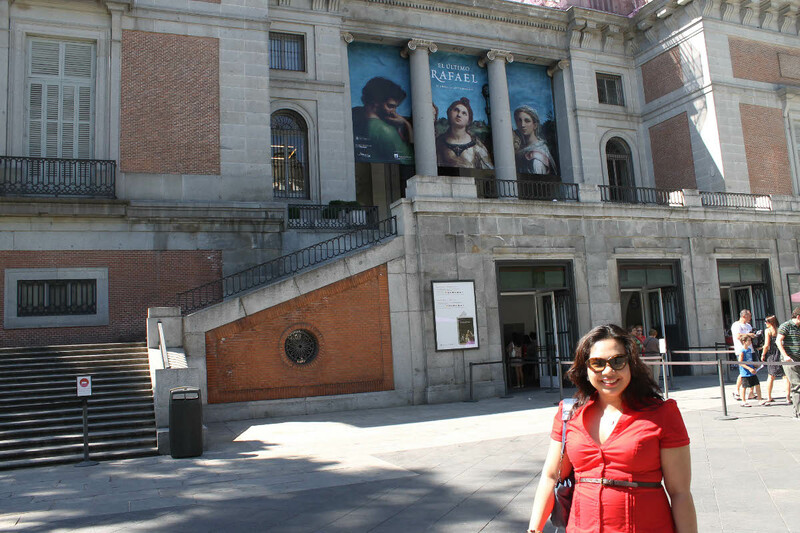 I loved Madrid so much! 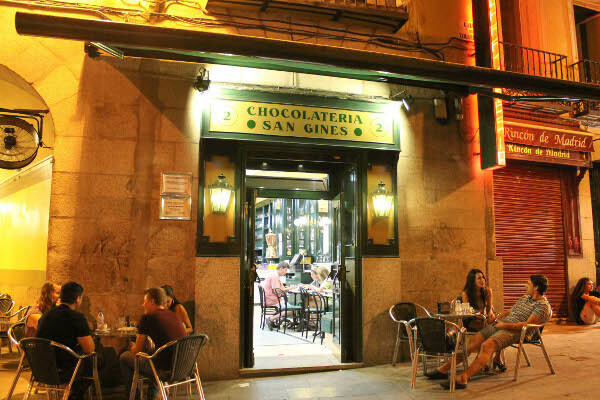 I actually missed my flight out because I was at Chocolateria San Gines eating Churros and lost track of time! 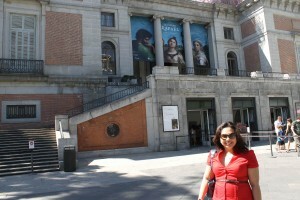 I stayed a few blocks from The Prado. I loved it and I hope to go back soon. Such a magical place. 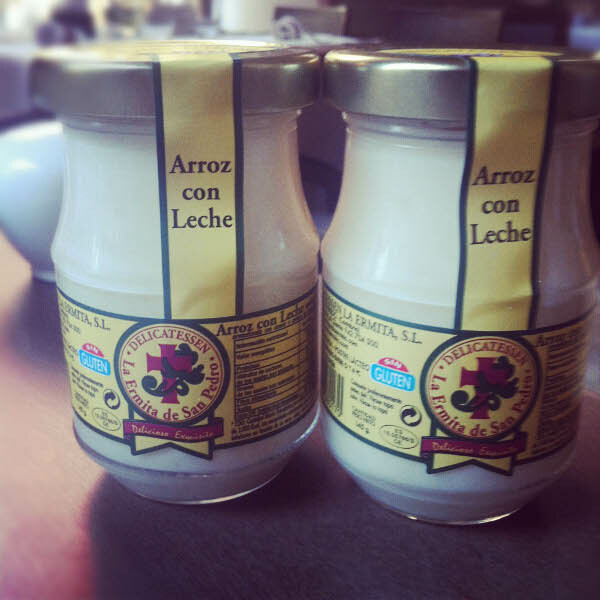 i absolutely loved reading this, it brought back my memories of my trip to spain last year. The hot chocolate looks amazinggggggggggggg. I’ll keep that in mind if I ever visit Madrid again. I never went to the Mercado market place. Oh well. 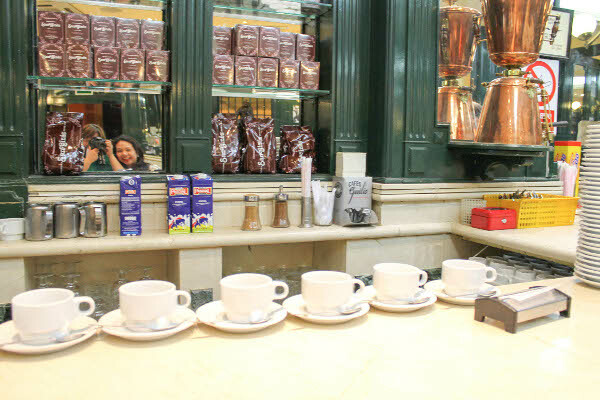 If I had known you were going, there was this one place I loved – La Mallorquina in Puerta del Sol – they served the best coffee and breakfast and pastries. It was a local spot too. Lovely photos! 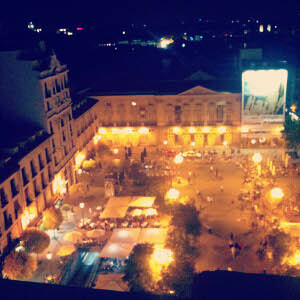 I loved Seville and Barcelona. A very fun country. I’m hoping I get to go to Barcelona next year – I will ask for your recommendations! 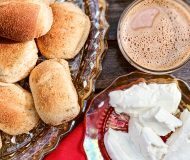 You had me at chocolate churros :) That looks amazing! What an absolutely amazing looking trip! 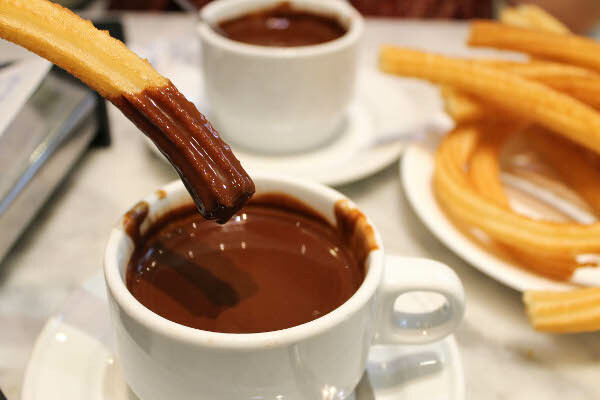 That chocolate dipping and churro looks just WOW. I do miss Spain. Europe was so much more accessible to me when I was at home in England. Ahhh Tracey I wish I can go back soon! I haven’t made it to England yet… someday! We started our visit to Madrid with churros (ignoring the fact it was barely 8AM!) And my favorite foods were also the pintxos at the Mercado de san Miguel, although mine were of the fish variety. So glad to read you had a nice trip. Spain really is a feast for the eyes, soul and stomach! What an awesome trip! With so much delicious food! You did a great job planning the gastronomic experiences. And I want those churros. Now. The photo of churros is heavenly. Brings us back to our trip to Barca and makes us want to go on the hunt in Boston for some churros now. Glad you had a great trip and looking forward to seeing more of your adventures in Spain. I adore these photos! I went to Spain in 2004 and would love to get back there eventually. Beautiful architecture, delicious food and wonderful people. What more could I ask for?